Editable royalty-free map of Ireland in vector-graphic online store. THE GREEN PASTURES of Ireland are kept fertile by the country’s mild, wet climate. Ireland was once ruled by Britain. 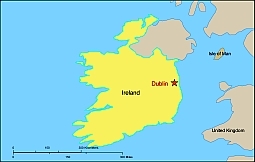 In 1922, southern Ireland – which makes up about two-thirds of the island – became an independent nation, while Northern Ireland remained part of the United Kingdom. Natural resources are few and traditionally much of the population was traditionally much of the population was employed in agriculture. However, a dramatic growth in tourism and light industry has radically altered people’s lives and has turned Ireland into one of Europe’s recent economic success stories.